May | 2010 | ATTACK OF THE RED ENVELOPES! Peter Jackson seems to be a popular guy on my blog lately! I don’t mean this intentionally, yet in four short months, this is the fourth movie for which I have done a write-up with his name on it. Of the first three, he directed two of them (Heavenly Creatures, Dead-Alive), and the third (District 9) he produced. This time around, we take another imaginative step into the past to uncover a murder mystery in The Lovely Bones. Susie Salmon (Saoirse Ronan) is a 14-year-old girl in Norristown, Pennsylvania. She’s the oldest of three children, she wants to be a photographer, and she has a crush on a boy who’d just arrived from England. In other words, she is a normal adolescent in a quiet suburban community. But one day, on her way home time from school, she encounters George Harvey (Best Supporting Actor nominee Stanley Tucci), a doll house builder who lives down the street from the Salmons. She is neither seen nor heard from again. Peter Jackson’s eye for camera angles and visual effects makes for a visually striking movie, but I could not help noticing some similarities with his past work. What stood out for me was the metaphoric shifts between the real world, where Susie’s parents (Mark Wahlberg, Rachel Weisz) contend with the loss of their daughter, and the “purgatory” in which Susie resides were strongly reminiscent of Heavenly Creatures. Also, some of the “blink-and-you-miss-it” shots of Susie’s realm look strangely like locations from the Lord of the Rings Trilogy (I guess it stands to reason, since Jackson filmed these scenes in his native New Zealand). Now, I’m not disparaging New Zealand at all. From what I understand, it is a lush, green country with some of the world’s most beautiful scenery. My concern is that the Kawarau Gorge may become to Peter Jackson movies what Vasquez Rocks is to Star Trek. There are some good performances in this movie, and some not-so-good. Tucci was particularly creepy as the killer, and Miss Ronan did well, too. But, as much as I like Wahlberg and Weisz, I could not get past the notion that they simply turned on their respective “grieving parent” switches for this one. And Susan Sarandon, another otherwise talented actress, was quite forgettable as the “helpful grandmother”, who just happens to have a whiskey glass and a cigarette in her hands every chance she gets. I’m sorry, but even her portrayal of Janet in Rocky Horror was better than this! To me, the best (and most understated) performance in this movie goes to newcomer Carolyn Dando, as the mysterious Ruth Connors, who seems to have the unique ability to “touch” Susie’s lost soul. It’s a fairly small role, but a meaty one, and Dando handled it well. Keep an eye on her; I think she may be going places. As for the script (co-written by Jackson and his wife/writing partner Fran Walsh), it seemed somewhat incomplete to me. It’s almost as if to say there is more to the story, and as an adaptation from a novel, this is usually the case. But still, I feel as if the clairvoyance angle of the story could have been better explained (at least, from the family’s point of view). Jackson’s employment of various symbolisms (nearly all of which are explained throughout the course of the movie) works for the most part, except for the icicles. I had a hard time wrapping my brain around that one; as a result, the ending left a somewhat bad taste in my mouth. The Lovely Bones is visually beautiful to watch, but it is far from a classic. To me, it plays out like a fictionalized version of Heavenly Creatures, only replace “repressed daughter” with “creepy single guy” and “mother” with “innocent teenager”, and place the murder at the beginning of the movie rather than at the end. I know Pater Jackson is a better filmmaker than this. I just hope his next project offers some redemption before he turns into New Zealand’s version of M. Night Shyamalan. This now immortalized line, spoken by Dr. Otternschlag (Lewis Stone), heralds the beginning of the Best Picture of 1932, Grand Hotel, a motion picture which holds a unique record in Academy Awards history, and also has a unique history of its own. It is the only movie to win Best Picture without so much as a nomination in any other categories. It is also one of the earliest examples of what is now known as the “ensemble cast”, which included Greta Garbo, Wallace Beery, Joan Crawford, Jean Hersholt (as in the Academy’s humanitarian award), and not one, but two Barrymores (Lionel and John, in their second of four films together). Grand Hotel spans three nights at the eponymous hotel in Berlin, where the lives of prima ballerina Grusinskaya (Garbo), Baron von Gaigern (John Barrymore), stenographer Flaemmchen (Crawford), businessman Preysing (Beery), terminally ill bookkeeper Otto Kringelein (Lionel Barrymore), war veteran Dr. Otternschlag (Stone), and porter – and expectant father – Senf (Hersholt) overlap, and in some cases collide. Grusinskaya is depressed, and her performances of late have reflected her mood. She is in such a funk, that she no longer wants to perform (It should be noted that this is the movie in which Garbo speaks her most famous line, “I want to be alone”). The Baron is a smooth operator, an easygoing gentleman who also happens to be a thief with a heart of gold, as well as a chaser of anything in a skirt. Flaemmchen is a stenographer and sometimes model called to the Grand Hotel to take dictation for Preysing, a business magnate with a solid reputation. Kringelein used to work for Preysing as a bookkeeper until he fell ill, so he decided to spend his final days in the lap of luxury, regardless the cost. The good doctor is a local who frequents the hotel and observes the goings-on. Finally, poor Senf the Porter, forced to work while his wife is in (very protracted) labor, cannot break free from his duties out of fear he’ll lose his job. Now that you know how everything starts, let me just say that Grand Hotel is an absolute delight to watch. I will caution that there are parts of this movie which belie its age, but in the grand scheme of things, it still shines as one of the best motion picture of the early years of the Academy Awards. Joan Crawford had already been a veteran in motion pictures by the time of Grand Hotel, but her role as the stenographer is among the first of her many meaty roles during her acting career. Meanwhile, there was much ballyhoo about the pairing of John Barrymore and Greta Garbo, so much that the normally (and notoriously) reclusive Garbo actually allowed backstage publicity photos of her with him. This unique union of The Face and The Great Profile proves to be one of the many captivating storylines in this movie. Finally, John Barrymore’s brother, Lionel, has a memorable scene when Kringelein confronts his boss, Preysing (Beery), at the hotel’s lounge and tells him how much of a slave driver he really is. For a place where “nothing ever happens”, a lot seems to be going on at the Grand Hotel. It is a story of star-crossed lovers, of unscrupulous businessmen, of happiness and tears, and (most important) a story that follows the Latin expression “Carpe diem” (Seize the day). It is a story of love discovered and of fortunes lost, and at the end of the movie, another busload of weary travelers step off the bus for their stay at the most famous hotel in Berlin. The special features on the DVD include footage of the premiere of Grand Hotel at Grauman’s Chinese Theatre, trailers for the movie (including a “Time is running out” trailer made for the Chinese Theatre), and a short from Warner Bros. called “Nothing Ever Happens”, a spoof of the movie. There is also a trailer for a remake released by MGM in 1945 called Week-end at the Waldorf, starring Van Johnson, Lana Turner, Walter Pidgeon, and Ginger Rogers (As of this writing, it is not available from Netflix; I will review it if and when it is released). Welcome to the conclusion of this three-part review, in which I have taken a journey spanning nearly 60 years, to look at three different movies based on the same story. I began with Jimmy Stewart’s The Shop Around the Corner, followed by the Judy Garland musical In the Good Old Summertime. Now, we have reached the end of our journey, with You’ve Got Mail, starring Tom Hanks and Meg Ryan, only this time they aren’t co-workers; they are business rivals. Tom Hanks plays Joe Fox, heir apparent to the monolithic Fox & Sons Books store chain. Meg Ryan is Kathleen Kelly, owner/proprietor of a children’s book store called The Shop Around the Corner (a nod to the original movie). Kathleen’s book store was started up by her mother, and it was a fixture in Manhattan for 42 years. When Fox Books moves in to open a store (literally) just around the corner, she is initially confident that her little store will continue (though we can all tell she is in denial). One day, a gentleman with two small children enter her store (the kids wanted to see the Storybook Lady) and he strikes up a conversation with Kathleen, introducing himself simply as “Joe”. Later, at a party, they bump into each either again, only this time she finds out second-hand that “Joe” is really Joe Fox of Fox Books. Let the battle begin! Now, the funny thing is that both Joe Fox and Kathleen Kelly have significants other (Parker Posey and Greg Kinnear, respectively) whose behaviors and habits are infuriating: Joe tells his friend Kevin (Dave Chapelle) that Patricia (Posey) “makes coffee nervous”, while Kathleen thinks Frank’s (Kinnear) fascination with typewriters borders on obsession. But, they both also have been secretly exchanging e-mails with someone they met online, and they both find themselves becoming more and more fascinated with their respective anonymous friend. But there is a catch: Joe and Kathleen’s online friends are each other. You’ve Got Mail is the second movie starring Hanks and Ryan that was directed by Nora Ephron (and their third, overall). On the up side, Hanks and Ryan work well together. Even at the peak of their conflict, you can still see the two characters ending up together. Meanwhile, the themes of large corporations squeezing out local businesses and of meeting someone online were very real concepts in the late 1990s. I used to live in a town which had numerous busy shops downtown, selling everything from CDs and TVs, to rugs and vacuums. When a “big-box” store (I won’t say which) decided to move into a new (and much larger) location in town, many of the stores downtown (and even in the local mall) were forced to close their doors because they couldn’t compete with the low prices the “big-box” store had. Meanwhile the Internet was still somewhat a novelty during this time, and chat rooms, bulletin boards, and discussion forums were popping up everywhere. Suddenly, a man in Columbus, Georgia, could strike up a conversation with a woman in Hilo, Hawaii, without the expense of travel or long-distance phone calls. At the time You’ve Got Mail was released, these were contemporary concepts. But times change. Today, with the economic slide of the past few years, small business has been making a comeback, and large companies have been pink-slipping their collective workforce. Meanwhile, the Internet has changed, too. America Online (from whom the title of this movie was inspired) is no longer an Internet service provider; it is now an Internet portal, free to everyone. And there are other avenues available today. With text messaging, instant messaging, Internet access on phones and other portable devices, and dating sites like eHarmony and Match.com, it is now unlikely you will “meet” someone online without ever knowing what they look like until you meet them face-to-face. You’ve Got Mail feels like The Shop Around the Corner meets Sleepless in Seattle. This isn’t necessarily bad, but it does share several elements with the Sleepless formula. It stars Hanks and Ryan, it’s directed (and co-written) by Ephron, and it’s about people fascinated with someone they’ve never met. And in both movies, Meg Ryan’s character has a boyfriend with whom she breaks up amicably (Here, Kinnear assumes the reins of Bill Pullman’s role from Sleepless). I saw this movie while on a date in early 1999, during its initial release. While it played a small part in what would develop into one of the better relationships I have forged in my life, I look back on it today with a fresh pair of eyes, and some of the luster seems to have worn off to me. Don’t misunderstand me. I still feel it is an entertaining movie, but just over a decade later, it already feels a bit dated. The charm of Hanks and Ryan does manage to rise above that, but I would prefer either Sleepless in Seattle or the original (The Shop Around the Corner) instead. And I dare say I enjoyed this movie. In the Good Old Summertime is the same basic premise of The Shop Around the Corner, only instead of a contemporary department store in Budapest, it’s set in a music store in Chicago. Also, the names have been changed to protect the innocent. The head clerk of the store is Andrew Larkin (Van Johnson), the boss is Otto Oberkugen (S.Z. Sakall), and the romantic interest/fly in the ointment is named Veronica Fisher (Garland). Replace the musical cigarette boxes with 100 table harps, throw in some slapstick, courtesy of Buster Keaton, and some old-tyme songs, and you have yet another Technicolor musical churned out by the factory known as Metro-Goldwyn-Mayer. The basic story is the same, in some cases nearly word-for-word, but the pacing is actually better than the original. Van Johnson tries not to impersonate Jimmy Stewart, but in some scenes it’s easy to spot that “aw-shucks” quality for which Stewart was famous. Judy Garland proves that even marriage and a child haven’t rusted her pipes. In one scene, a frustrated Veronica is asked to demonstrate a Christmas song; she does so, but only going through the motions in the process. Even in that moment, it’s hard to dismiss her vocal talent. Speaking of talent, I made discovery with this movie: Marcia Van Dyke. She is an accomplished singer and musician in her own right, and here she shows off one of those talents. Her character, Louise Parkson, lives in the same boarding house as Andrew, and she is a violinist, a damn good one. Several scenes showcase her talent, culminating in an audition for a scholarship in Leipzig, Germany (home of one of the most prestigious orchestras in the world). Van Dyke isn’t much of an actress, but where she lacks in that department, she more than makes up for it with a violin in her hand. And she was very easy on the eyes, too. One of the things that I noticed in this movie is that many of the musical numbers, especially in the first half, were in 3/4 time (waltz tempo). Now, I’m a sucker for the waltz, but I think even Johann Strauss himself might have cried out “Okay! Okay! Enough with the waltzes! Let’s move on, shall we?” But overall, the music fit in well with the plot, with one minor exception. Okay, maybe not so minor. The bulk of the movie is set in the fall and winter, but MGM needed an excuse to use the song “In the Good Old Summer Time”, which was still a fairly popular tune nearly 50 years after its initial release. So, they bookended it with two brief scenes set in a park during the summer. I’m not sure how, but they managed to pull it off. Oh, there is one more thing: At the very end of the movie, Veronica and Albert are strolling through the park with a little girl; that brief scene marks the (unofficial) motion picture debut of Judy Garland’s daughter, Liza Minelli. The DVD comes with a pair of travelogue shorts about Chicago, one for day, one for night. Both are remarkable time capsules to a time that is now all but forgotten. The daytime tour features many fixtures of the skyline, including the Tribune Tower, the Wrigley Building, and the Drake Hotel, along with a parting shot of Buckingham Fountain. The nighttime featurette highlights some of the entertainment and night life aspects of the city, including a music hall frequented by the mayor, Martin H. Kennelly, as well as a dancing horse(!). When I first set up this little blog of mine, I did back-to-back reviews of the two movies called The Italian Job. In it, I said that I would be doing this from time to time. On that note, a question: What do James Stewart, Judy Garland, and Tom Hanks all have in common? Well, they all starred in movies with the same premise. First up is 1940’s The Shop Around the Corner, starring Mr Stewart and Margaret Sullavan as co-workers who can’t stand each other, but don’t realize they’ve been developing a budding romance through the mail. Based on the play “Parfumerie”, by Miklós László, The Shop Around the Corner is set at a small department store in Budapest, Hungary. Alfred Kralik (Stewart) has been working there for nine years, under his boss (and store’s namesake) Hugo Matuschek (Frank Morgan). Other members of the staff include the cowardly and family-concsious Mr. Pirovitch (Felix Bressart), the smug and oily Ferencz Vadas (Joseph Schildkraut), two long-time female clerks named Flora and Ilona (Sara Haden, Inez Courtney), and an energetic errand boy named Pepi Katona (William Tracy). One morning, an out-of-work store clerk named Klara Novak (Sullavan) approaches Aflred for a job. He says that Mr. Matuschek is not hiring at present. She then asks Mr. Matuschek, who confirms Mr. Kralik’s answer, so she improvises. A customer spots her holding a cigarette box, so Klara takes the initiative. She approaches the lady, who asks if it’s a candy box (Klara says it is), and opens it. It starts playing “Ochi Tchornya“, and the lady balks, saying how silly it would be to reach for a candy and to hear that song every time it opens. Klara says that the box will make ladies who tend to indulge themselves to be “candy conscious”, and she makes the sale — at a higher price! She gets hired. Practically from that moment on, Klara and Alfred seem to have nothing better to do than argue with each other at work. But they do have something in common: They each have a secret romantic pen pal. Meanwhile, the usually charming Mr. Matuschek becomes more and more distant toward Alfred, and Mr. Vadas has suddenly made a splash about town, wearing expensive suits, fur coats, and even a pinky ring (Not bad for a store clerk’s wages, eh?). Anyway, I won’t give the whole story away, except for one thing: Klara and Alfred can’t stand each other face-to-face, but they are really each other’s romantic pen pals! This is a charming little movie, which still holds much of its luster. Jimmy Stewart was such an underrated talent, his “aw-shucks” style of delivery makes him both a leading man and an everyman. Margaret Sullavan seems a little too forward for my taste, but softens up nicely whenever she smiled. The supporting cast was fairly good, with one exception. Pepi intervenes on a very dramatic moment in the movie. Afterward, he drops many not-so-subtle hints about what happened (though the affected party wanted discretion) and takes advantage of his position. The way William Tracy played it, I kept thinking “This guy is a real jerk!” If that was the intention, then he did well, but I didn’t like him for doing this. There are some nice gags in this movie, too. Remember those musical cigarette boxes? In one scene, when a character is unceremoniously sacked, he is pushed into a display of those boxes. They all fall to the floor open, and everyone swoops in, not to pick up the now ex-employee, but to close the boxes up again! In the history of motion pictures, there are a few select years in which the Academy got them all right, and it’s almost a sure thing that you have seen at least one Best Picture nominee from that year. The usually-mentioned first “great year” was 1939, when Gone with the Wind took Best Picture. There were nine other nominees that year, including Ninotchka, Goodbye, Mr. Chips, Wuthering Heights, and a little-known fantasy called The Wizard of Oz (perhaps you’ve heard of it). 1977 is said to be another such year, with Woody Allen’s Annie Hall taking the honors, while another small film called Star Wars waited in the wings. Here is an interesting fact: Director Herbert Ross helmed two of the five Best Picture nominees in 1977, The Turning Point and The Goodbye Girl. And, like Star Wars, they also watched while Woody Allen won. I have seen both of these movies, and both are excellent. One is a drama, the other a comedy, and both are about dancers. Today, I focus on the lighter of these two movies. Paula McFadden (Best Actress nominee Marsha Mason) is an ex-dancer in New York City. For the last couple of years, she and her daughter Lucy (Best Supporting Actress nominee Quinn Cummings, in her official motion picture debut), have been living in an apartment with a stage actor named Tony. We first meet Paula and Lucy on their way home from a shopping spree, eagerly anticipating their upcoming move to L.A. (Tony got a TV gig). But when they get home, Paula finds a “Dear Jane” letter from him, saying he took a six-month movie shoot in Italy instead. But it gets better! Later that day, she finds out Tony had sublet the apartment to somebody else! Enter Elliot Garfield (Best Actor Richard Dreyfuss), an actor from Chicago who is about to start rehearsals for his first New York production. He enters the apartment building from the pouring rain, sticks his key into the lock, turns it… and discovers the door is chained from the inside! Puzzled as to why he can’t enter, he hits the buzzer to figure out what’s going on. To say this relationship starts on a rocky note is an understatement, but seeing that he has the legal right (and the money) and she has a child to take care of, they agree to share the apartment. This is why I like Neil Simon. I have regarded him as one of the greatest American playwrights. He is to contemporary comedy what Tennessee Williams was to Southern melodrama. There is really no other way to put it. Now, most movies with Simon’s name on them start out as plays, like The Odd Couple or Barefoot in the Park. 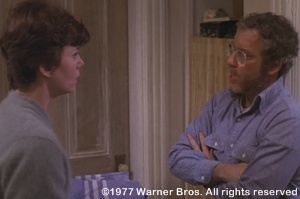 But The Goodbye Girl was written directly for the screen, and with Simon’s (then) wife, Marsha Mason, in mind. But it still looks and feels like a Neil Simon play. One of his trademarks is how he writes conflict into his scripts: Two characters (usually the leads) start yammering about two completely different things, then the conversation comes closer and closer to the subject at hand until they are both talking about the same thing, only to drift off into opposite directions again (I picked that little gem of information up from my high school drama teacher, Susan Stauter. See? It is possible to recall things you learned in high school! Wherever you are, Ms. Stauter, I hope you are well). Anyway, The Goodbye Girl stands out as one of the great romantic comedies of the 1970s, and arguably of all time. Both Dreyfuss and Mason are a delight to watch, especially when they first meet! On that first night, you will be thinking “Wait a minute! These people hate each other!” And they do. Just watch it for yourself, and see what happens. Both Dreyfuss and Mason give energetic performances. And, since a performance is sometimes based on the quality of the script, it stands to reason that the screenplay is also top-notch. As for Quinn Cummings, who makes her official debut in this movie (she also had an uncredited role in Annie Hall that year), her portrayal of Lucy was spot-on. Lucy is our eyes and ears in this movie. Let me explain. Good drama requires two basic types of people, participants and observers. Paula and Elliot are obviously participating in a developing relationship. Lucy is on the outside. She is watching these events unfold as an independent third party, making her the observer. And before you say “But she is her mother’s child”, remember that Lucy is not the one directly dealing with Elliot, Paula is. Therefore, as an observer, she get to be our eyes and ears, as we watch Paula and Elliot’s relationship develop. As for the character herself, Lucy is supposed to be at just that right age when she is learning and discovering how things really work in this world. As a result, Lucy is supposed to possess a special curiosity and innocent wisdom, as evidenced during the opening credits, when Paula tells Lucy she was “born [at age] 26”. As played by young Miss Cummings, Lucy comes off as a child with that kind of precociousness. I will be the first to admit that The Goodbye Girl isn’t my personal favorite of Neil Simon’s work (That honor goes to The Odd Couple), but it is among the best that Neil Simon has to offer. A note to all you guys out there: This is a great movie to pop into the DVD player with your other half on a rainy night, just you, her, the movie, and a giant bowl of popcorn. Trust me. If she hasn’t seen this one, she’ll be glad you introduced her to it. It was great to watch 30 years ago, and I can still watch it today. And even now, it will still make me smile. 1931, best picture, cimarron, congress, courtrooms, edna ferber, Edna May Oliver, epic, Estelle Taylor, Irene Dunn, name in title, newspapers, oil, oklahoma, oklahoma land rush, oscar winner, prostitutes, Richard Dix, Romance, shootouts, sooners, spanish-american war, Wesley Ruggles, western, William Collier Jr. The story of the formation of Oklahoma as a state is fascinating in its own right. More than a few movies have depicted the famous “land-rushes” that took place in the late 19th Century, and Cimarron was among the first to do so. The word cimarrón itself is Spanish. It means “wild”, “untamed”, “feral”. In the context of the movie, the so-called “Cimarron Territory” in Oklahoma was a strectch of about two million acres of land deeded out to settlers in the 1889 Oklahoma Land Rush. It is here, in the moments prior to this event, that we are introduced to Yancey Cravat (Richard Dix), a flamboyant, self-made man and bona fide rolling stone. Nearly everyone knows who he is in some capacity, as if he were some kind of celebrity. He is an attorney, newspaper man, gunslinger, and preacher all rolled into one. He’s a great friend to have, and a dreadful enemy to fear. The plot of Cimarron then spends the next hour-and-a-half leapfrogging over the next 40 years. In that span, the town of Osage transforms from a wild frontier town to a bustling city. And Yancey’s paper, the Oklahoma Wigwam, thrives from a weekly one-sheet publication into a daily voice of equal rights for everyone. But Yancey doesn’t stay around long. He leaves for the Cherokee Strip run of 1893, comes back after serving as a Rough Rider in 1898… In fact, he pretty much comes and goes as he pleases, while long-suffering Sabra stays behind to mind the day-to-day operation of the newspaper. Now, Yancey Cravat is a noble man. He’s devoted to his wife and family. He feels everyone deserves a fair chance in this world. He knows the Bible from cover to cover. But as I already said, he is the quintessential rolling stone. Early on in the movie, he proudly proclaims that the longest he had stayed in one place was in Wichita, and for the rest of the movie, he lived up to that statement, disappearing for years at time, only to blow into town and act as if he was gone only a few days. I do not claim to be an historian, but behavior like that from a husband isn’t normal by today’s standards, and I don’t think it would’ve been tolerated in 1893, either. I’d like to address an issue that is associated with Cimarron: racism. Both Edna Ferber’s novel and this motion picture are reputed to be laced with racial stereotypes. I cannot speak for the novel (I’ve never read it), but the movie does contain material some people may find offensive by today’s standards, like black people using “Mammy-speak” and craving watermelon, and Native Americans being labeled as filthy, uneducated savages. But there are two things to consider. First, this movie was filmed in 1930 (and released early the next year). Hollywood (and much of the U.S.) didn’t really know any better. We are talking about a period when white stage performers put on blackface makeup because blacks themselves weren’t allowed to perform, when a popular radio program about two black men, “Amos & Andy”, was voiced by white actors, and when everything from restaurants to restrooms were labeled “White” and “Colored” throughout the country. Yes, it reads like an excuse, and it probably is. But there is no arguing these were societal norms from a now-embarrassing period in American history. The other aspect, which I feel balances the stereotyping, is Yancey’s outlook on people in general. He accorded everyone, from Isaiah to the Indians to Dixie Lee (who ran a brothel) with the same respect. He treated Isaiah like a member of his own family. He (rightfully) believed the Indians were forced from their lands to make room for the White Man. And he (successfully) defended Dixie Lee in court when no one else would. And his way of treating people would rub off on his wife, and even onto many of Osage’s citizens (even if Yancey was gone for years at a time). Just something to consider when screening this movie. Now that we have that behind us, let’s spend a little time on the movie itself. There are moments of brilliance in Cimarron, most notably in the land rush sequence at the beginning. It is amazing to watch, especially when you consider the logistical hurdles involved. In all, over 5,000 extras and 28 cameras were used over the course of a week to shoot it, and the end result is a thrilling joyride through the Oklahoma wilderness. It’s a shame most of the rest of the movie seems bland by comparison. The performances were mixed, from the over-the-top nobility of Richard Dix’s Yancey, to the melodrama of Irene Dunn’s Sabra, to the stereotypical comic relief of Edna May Oliver’s society woman, Mrs. Tracy Wyatt. There are two shorts that accompany the DVD. One is an early Warner Bros/Vitaphone cartoon called “Red Headed Baby”, one of the first Merrie Melodies produced by Leon Schlesinger. It’s rough around the edges, even for early cartoons, but still fun to watch. The other is a truly rare piece called “The Devil’s Cabaret”. The acting is cheesy and the humor is awful, but what makes it special is that it’s a 1930 two-strip Technicolor film, one of the earliest known to exist. A real treat for fans of early cinema! I never thought in a million years that my review of Cimarron would be the longest I have written to date. But there was a lot of ground to cover. This is not the best of the Best Picture winners by any stretch of the imagination, but it is a time capsule into cinematic history nonetheless. I would recommend it only to those who specialize in the history of movie-making. For the rest of us, I suggest going with a better Ferber adaptation, 1956’s Giant.